A rare condition left a Pennsylvania woman legally blind. 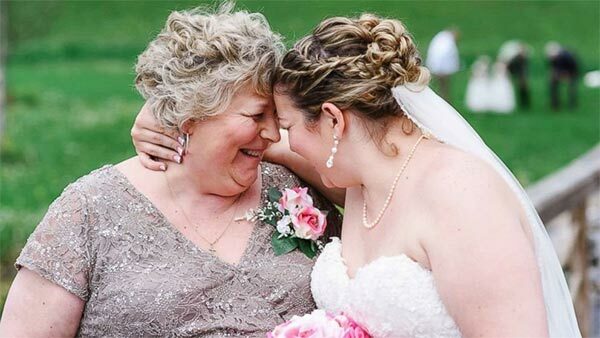 But thanks to $15,000 in donations she was able to purchase high-tech glasses that allowed her to see her only daughter walk down the aisle. In January 2014, 54-year-old Joy Hoke, of Sellinsgrove, became legally blind in her right eye due to non-arteritic anterior ischemic optic neuropathy (NAION), a loss of blood flow to the optic nerve that causes sudden vision loss. The previous year, Hoke, a former daycare supervisor, had lost vision in her left eye, also due to the same condition. At the time, one of the first things that came to her mind was not being able to see her daughter, Lauren, in her wedding dress. "I'm legally blind. I can't drive. I can't work. I can't read and then I'm not going to be able to see my daughter get married or see my grandbabies," Hoke told ABC News. It was during that time of hopelessness that Hoke's husband, Dave, got a text from a friend telling him about a pair of glasses for the legally blind. The glasses, made by eSight, are actually a headset with a camera inside that captures video that is sent back to the headset in a form a visually impaired user like Hoke can see. "Without the glasses my visual acuity was 20/400 and with the glasses my acuity was 20/40," Hoke said. The glasses cost $15,000 a pair and were not covered by Hoke's insurance. Her friends and family set up a GoFundMe page that raised enough money that Hoke was able to purchase a pair of eSight glasses and donate $2,000 to help another blind woman purchase a pair. Hoke got her glasses at the end of 2015, and on May 7, she wore them as she watched her husband walk their daughter down the aisle and Lauren say "I do" to her new husband, Jeremy. Read the whole story from ABC News.